The Art Deco-era Metropolitan Theater, later renamed the Bijou, was originally part of a mixed-use edifice. The three-story building accommodated the cinema, the First Bank of Hermosa Beach and meeting spaces for two Masonic lodges. Architect Richard Douglas King, who designed numerous commercial and civic buildings across the Los Angeles region in the 1920s, designed the Metropolitan. King designed or remodeled several theaters, including the 1924 Ravenna Theater in central Los Angeles. One of his best-known works is the Villa Riviera Apartments on Ocean Boulevard in Long Beach, one of the tallest buildings in the area, second only to L.A. City Hall when it was finished in 1929. For the Metropolitan's grand opening in 1923, the theater premiered Circus Days, starring Jackie Coogan, along with five Orpheum acts, a novelty act and a cooking comedy. The extravaganza lasted until 2:00 a.m. Following the grand opening, the Hermosa Beach Review described the Metropolitan as having a beautiful entrance underneath a marquee of rare artistic design, a tiled lobby and "jazzed plaster decorated in various colors." The interior architecture was prominently arched, featuring alcoves throughout. Patrons of the theater, surrounded by expensive hangings and costly paintings, would sit on mammoth divans and leather opera chairs and listen to the $20,000 Roberts Morgan pipe organ. 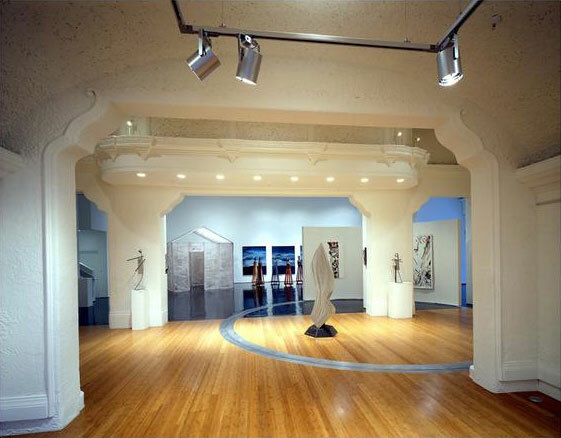 Led by Christopher Korner and in partnership with art consultant Perkey and architect Phillip Trigas, Graft developed an innovative and flexible program for Gallery C's conversion of the Bijou Theater. Graft, whose very name promises a hybrid of cultures, eschews working in a signature style. Instead, partners Wolfram Putz, Lars Kruckeberg, Thomas Willemeit and Korner prefer collaborative projects and investigations that source a wide variety of influences, styles and artifacts.